Isn't she cute. I wonder what she is making. That is some technique she has with that bill there. I could try that next time I guess. LOL! Love that ducky's technique! Vintage type designs are just so very sweet! I agree. 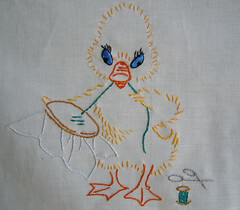 I love vintage pillowcases, etc... with embroidery! That duck is precious! I LOVE all the vintage embroidery you are posting! I collect vintage linens and you have some darling pieces!!! I wish I could get together for even just one day with my blogger friends - such fun we would have!!! I will not be defeated! Someone is in the pink!